A couple of years ago, I was perplexed by an issue. Why are some people and organisations more innovative, more influential, and more profitable than others, even though they may be less funded, less equipped, and possibly far inferior? Why do some command greater loyalty from customers and employees alike? Everywhere, small start-ups were outwitting big giants, and “little” people like Nelson Mandela, Gandhi and Sam Walton were out-muscling far more advanced and illustrious opponents. Why is Apple considered more innovative than Samsung, even though Samsung wins more innovation awards? Mozilla is a small foundation with less than 60 employees but their Firefox product is far superior to mighty Microsoft’s IE, which has more resources, talent and funding. A couple of years ago, I interviewed Wikipedia founder Jimmy Wales on The Leaderonomics Show. Wikipedia had one employee yet eliminated heavy-weights Encyclopaedia Britannia and Microsoft’s Encarta to become the world’s largest encyclopaedia. This question kept bugging me until I met Simon Sinek via a TED Talk, who similarly grappled with this issue. He studied the lives of Martin Luther King, and the Wright brothers, who did not have as much funding or expertise as Samuel Langley in the aviation wars, yet won against the odds. Sinek found that successful people think and act completely opposite from the others who end up “losing”. He used three words – WHY, HOW and WHAT in a concept he named “the golden circle”. The outermost circle, labelled “What” represents, for example, a company’s product. The next circle, “How” would be the technology behind this product, and the innermost circle represents “Why” the company makes the product. With successful individuals, everything started with “Why” followed by “How” and finally “What”. Sinek discovered that the “losers” communicate in the exact opposite manner. He adds, “any organisation can explain what it does; some can explain how they do it; but very few can clearly articulate why”. Success can easily be replicated if we all start practising “inside-out” instead of “outside-in” leadership. The Why-How-What model is actually grounded in biology. Our brain is split into the neo-cortex and the limbic brain. The neo-cortex (how and what) is responsible for all our rational, analytical thought and language. Our limbic brain (why) is responsible for feelings, trust and all human behaviour and decision making with no capacity for language. When we communicate from the inside-out, we are speaking directly to the parts of the human brain that control behaviour. The neo-cortex will then follow, rationalising that behaviour. When we communicate from the outside-in, people may understand vast amounts of complicated information, but may not trigger behaviour. This is why you can give someone all the benefits of your product but they still don’t buy your products while in some cases (as with Apple iPhone 4 with receptor problems), people would still flock to the product. Steve Jobs once said, “Innovation has nothing to do with how many R&D dollars you have. When Apple came up with the Mac, IBM was spending at least 100 times more on R&D. It’s not about money. It’s about how you’re led.” Jobs understood clearly how to lead and it meant starting with the “why”. 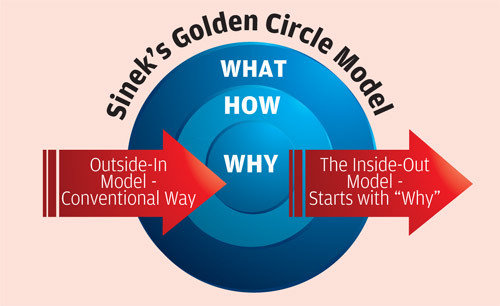 The crux of Sinek’s idea lie within this centre “why” circle. The “why” represents an entrepreneur’s beliefs and passion. Why does your organisation exist? This is probably the most important strategic question your business needs to answer yet most people answer this question with “making money”. Making money is necessary for survival but cannot be your sole purpose. After all, we all need good health to live but that doesn’t make good health the purpose of living. Your “why” should be enduring and involve a social contribution and be worthy – bringing a sense of purpose. Here are some examples – Google (let’s organise the world’s information), Mozilla (let’s kill Microsoft), Apple (let’s reinvent the status quo), Wikipedia (let’s all contribute knowledge and create a true depository of global information), AirAsia (enabling everyone to fly) and Leaderonomics (let’s transform the nation). Knowing your “why” gives you direction. You tend to have more opportunities than you could possibly pursue. Knowing why you exist helps you decide what you will do and what you will intentionally choose not to do. He built an entire infrastructure to support his “why” including the world’s best supply chain, an EDI system that ensured cost efficiency, hiring of “lower cost” retired folks, establishing stores in remote locations where rental was lower, completely cutting out advertising and keeping his corporate team as lean as possible. Most organisations benchmark Walmart and try to copy its “how”. However, the “how” at Walmart has its foundation on its “why”, thus making copying immaterial. AirAsia’s “why” was to ensure “everybody can fly”. Their “how” was to build an entire infrastructure to support this “why”. To enable everyone to fly, they needed to manage costs and price tickets from zero (for those with no money) to full price (for those who can afford to pay). If their “why” was to be the “best low-cost airline”, all their tickets would be priced low. Essentially, the “how” are ways the “why” gets accomplished – your value system, your processes and structures, your infrastructure, the talent in your organisation and the eco-system you create to support your “why”. Wikipedia’s “why” enabled them to build an entire web eco-system (how) with a global volunteer and policing organisation. Martin Luther King most famous speech was “I have a dream” not “I have a plan”. We all fall victim to needing to have plans but we should learn from history and always start with the dream. Learn to start with purpose, not product. Amazon.com is a business that defies logic – an online retailer that has become the biggest bookstore in the world. Jeff Bezos, its CEO and founder, knew his “what” – to open an online book store. But unlike others, he didn’t start with “what”. He spent countless hours in traditional brick-and-mortar bookstores trying to figure out “why”. As Bezos visited bookstores, he realised there was an “experience” people went through buying books. His “how” was to ensure the “experience” in a traditional bookstore was replicated whilst the frustrations (ie. lack of book titles) was addressed. This infrastructure that he built cost millions but guaranteed Amazon provided a truly unique customer experience – his “why”. Finally, after this entire infrastructure was built, he focused on the “what” – the actual products and services that Amazon offered – books, music and videos. The “what” may have started out as a bookstore, but once he understood his “why”, it progressed into much more. Likewise, Apple started out as a computer company, but its “why” was to make a dent in the universe. Apple believed that “everything we do, we do differently”. It believed in challenging the status quo. That was its “why”. And “how” it challenged the status quo was by hiring talented people and making beautiful products with great designs. And finally, “what” Apple does is make computers, MP3 players, phones or anything that supports their “why”. We often communicate starting from the “what”. Companies communicate “what” they’re selling. But the truth is, people don’t buy what you do. They buy why you do it. There is a difference between giving direction and giving directions. Direction is the end destination (your “why”) to which you are headed whilst directions (your “how” and “what”) is the plan to get you there. Leaders often give directions when they should be setting direction. Martin Luther King inspired many to make a difference on racism. Interestingly, his speech began with “I have a dream” and not “I have a plan.” We think a great business begins with a solid business plan. But numerous businesses built on solid business plans don’t last either. Instead, start with “why” and you may just end up inspiring millions.